If you have a charity you would like us to help support please feel free to reach out to our HR team! This April, every 2 Facebook check-ins or reviews at Coast to Coast Events will provide a minute of therapy to a child with autism! We’re working with Causely and The Autism Site to make it happen. You can add #autismawareness to promote the cause. For more information about this month’s charity, check out theautismsite.greatergood.com. This March, every Facebook check-in or review at Coast to Coast Events will provide a vitamin to a child in need! We’re working with Causely and Vitamin Angels to make it happen. 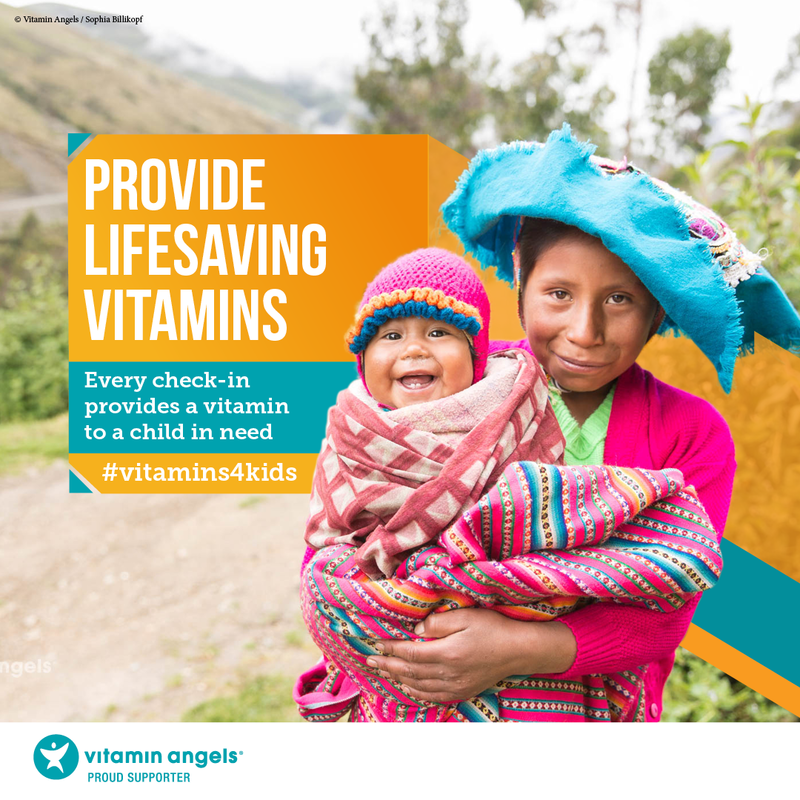 You can add #vitamins4kids when you post to promote the cause. For more information about this month’s charity, check out vitaminangels.org. This February, every 10 check-ins at Coast to Coast Events will help save the life of a rescue animal! We’re working with Causely and Best Friends Animal Society to make it happen. 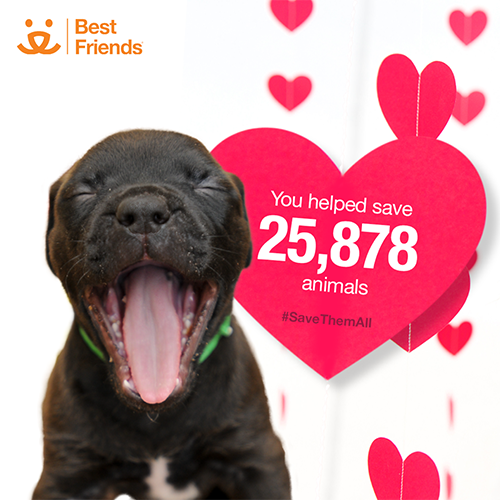 You can add #SaveThemAll when you check in to promote the cause. For more information about this month’s charity, check out bestfriends.org. This January, every check-in at Coast to Coast Events will help provide a life-changing surgery to a child in need! We’re working with Causely and Watsi to make it happen. You can add #changealife when you check in to promote the cause. 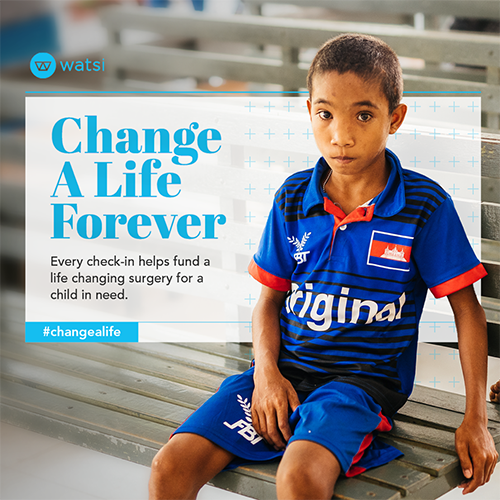 For more information about this month’s charity, check out watsi.org. This December, every 5 Facebook check-ins, reviews, or Instagram tags at Coast to Coast Evevnts will provide the gift of a book to a child in Tanzania. We’re working with Causely and Books for Africa to make it happen. You can add #givebooks when you check in to promote the cause. 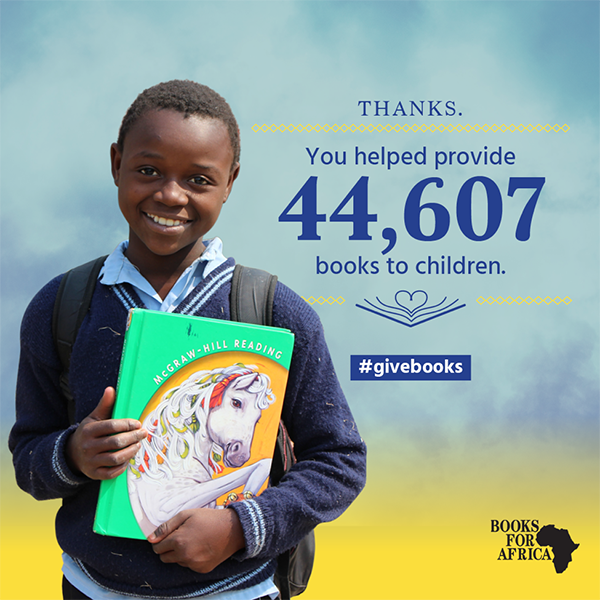 For more information about this month’s charity, check out booksforafrica.org. This November, you can help feed children just by checking in on Facebook at Coast to Coast Events. 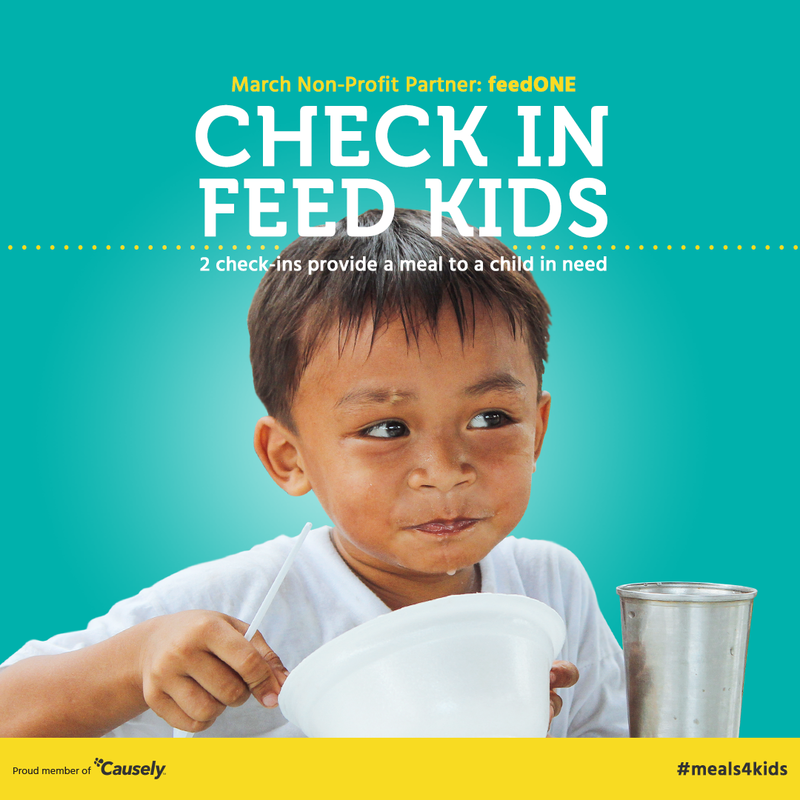 We’ve partnered with Causely and feedOne to make it possible and every 2 check-ins at will provide one meal to a child! So don’t forget to check in on Facebook each time you visit us. For more information about this month's cause, check out feedone.com. During September, every 20 check-ins at Coast to Coast Events will und one minute of pediatric cancer care research. We’re working with Causely and CureSearch to make it happen. 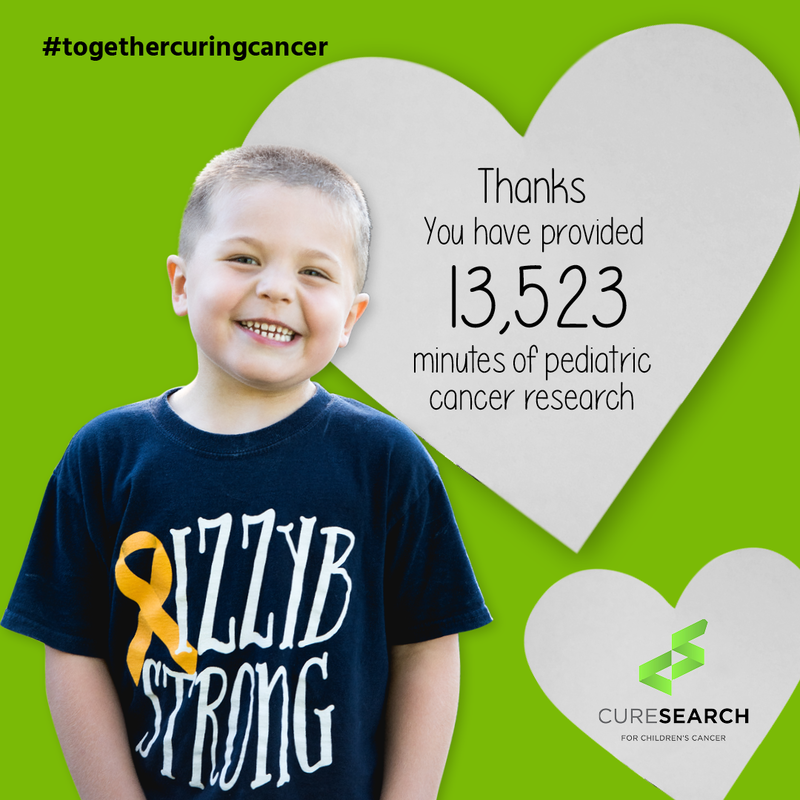 You can add #togethercuringcancer when you check in. 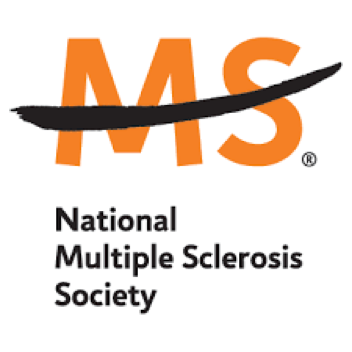 For more information about this month’s charity, check out curesearch.org. This July, we are excited to partner with H2OpenDoors again to provide safe drinking water to people in need. H2OpenDoors is a program of Rotary clubs around the world with a long term goal of providing access to clean, safe drinking water for one million people throughout developing nations. The team of volunteers at H2OpenDoors travel to areas of the world most in need of clean water and install a SunSpring water filtration system that will provide safe drinking water for 10,000 people every day for 10 years. Every check-in this month will provide 50 gallons of safe water to someone in need. If you want to learn more about H2OPenDoors, you can check them out at www.h2opendoors.org. 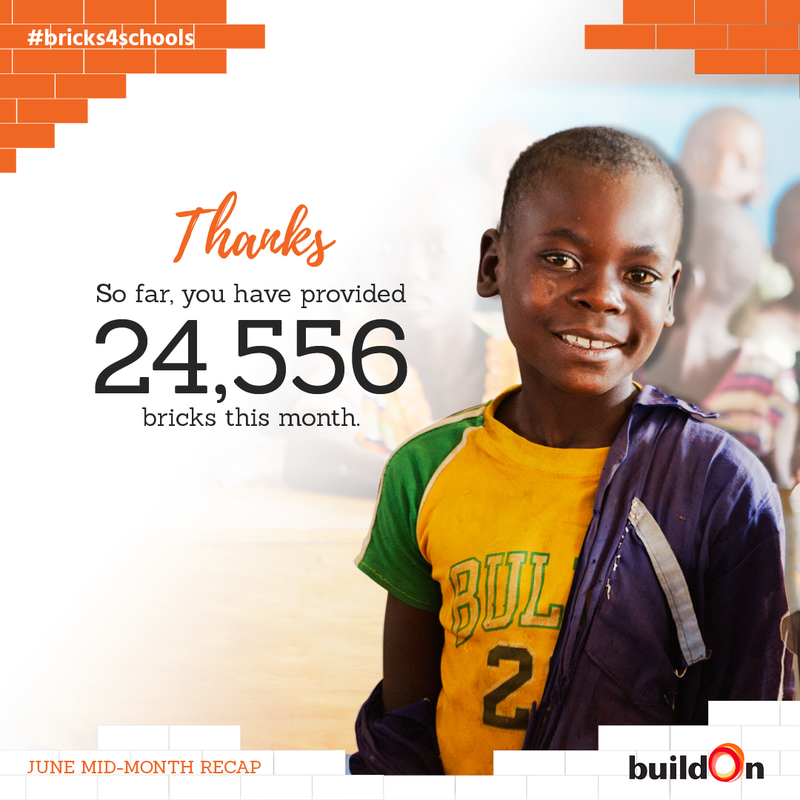 This June, we partnered with buildOn to provide bricks to build schools in developing nations! Every 6 check-ins provided one brick to build a school. buildOn’s mission is to build schools in villages that historically have had no adequate school structure. buildOn has built more than 1000 schools in seven countries around the world: Burkina Faso, Haiti, Mali, Malawi, Nepal, Nicaragua and Senegal. This month, check-ins at our location are going towards building a school in Malawi. If you want to learn more about buildOn, you can check them out at http://www.buildon.org. 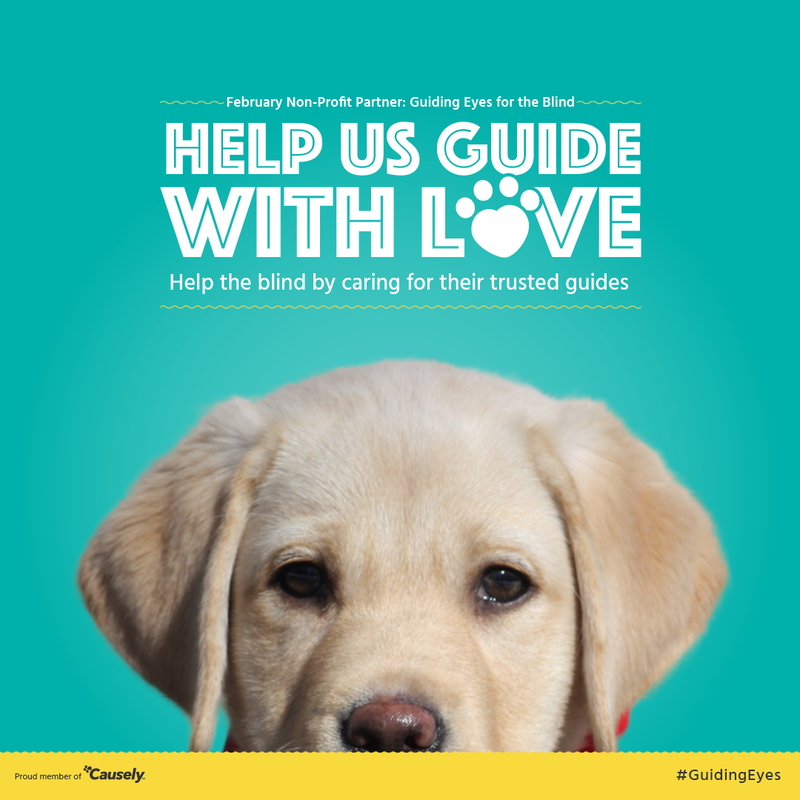 For the month of May, we partnered with Guiding Eyes for the Blind and all of you! Through our partnership with Guiding Eyes, we were able to help the blind by caring for their trusted guide dogs. 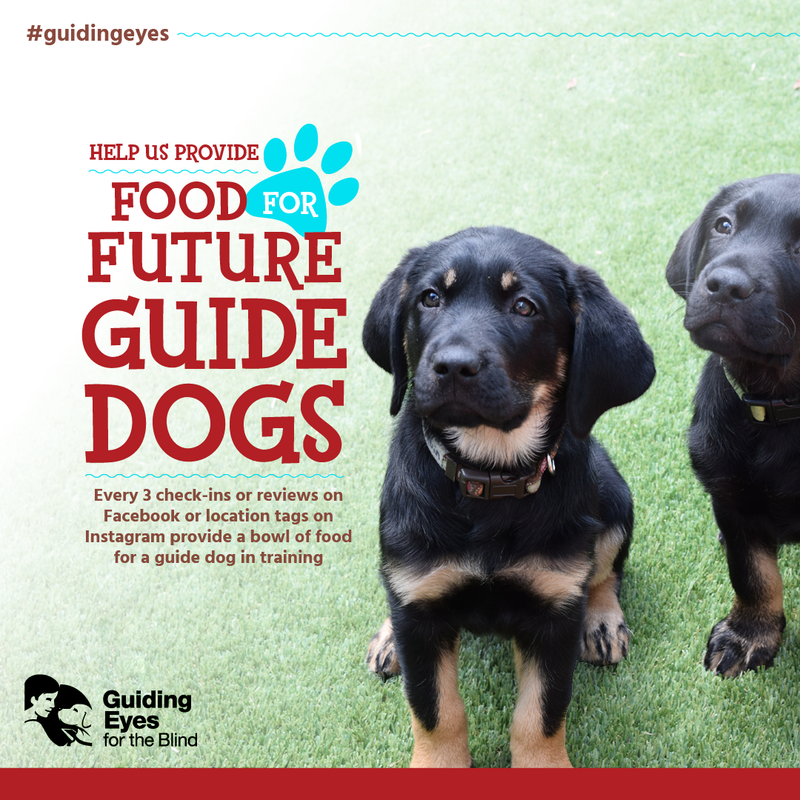 Every 3 check-ins provides a bowl of food for a guide dog in training. Guiding Eyes for the Blind trains guide dogs and partners them with people who are blind or visually impaired. Once a dog is trained, Guiding Eyes pairs their exceptionally trained dogs to people who are seeking increased freedom and independence, so that together, they can experience all kinds of life adventures. If you want to learn more about Guiding Eyes for the Blind, you can check them out at www.guidingeyes.org. For the month of April, we are so excited to partner with The Autism Site and all of you for autism awareness and acceptance month! 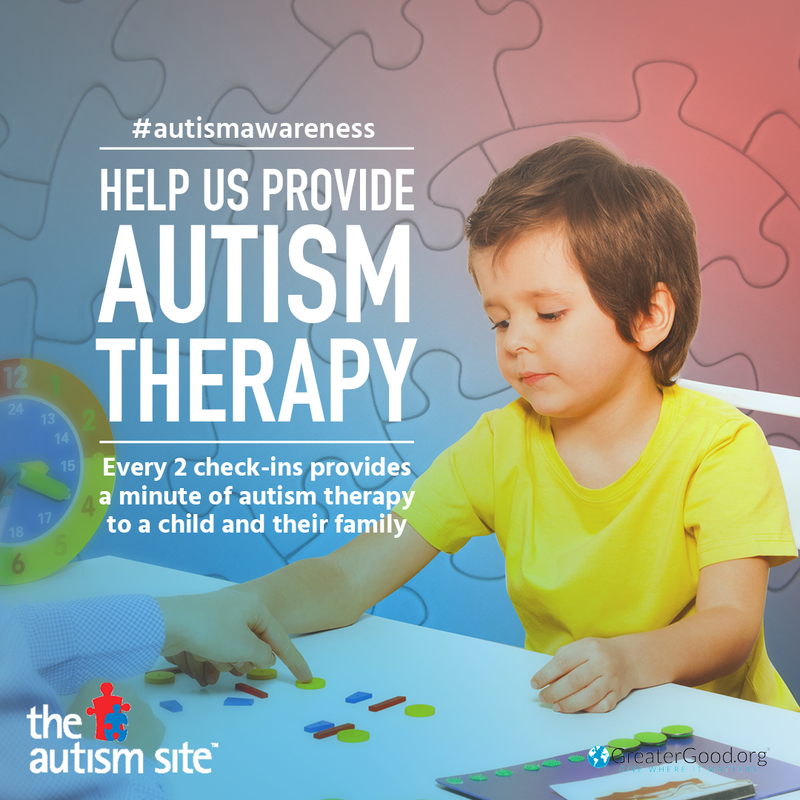 Every 2 check-ins throughout April will provide one minute of therapy to an autistic child and their family. We have partnered with The Autism Site for the last 5 years and have raised over one hundred fifty thousand dollars and provided over six hundred thousand minutes of therapy to families that need and deserve it. The Autism Site provides access to incredible play therapy sessions that promote long-term and short-term memory, stimulate language, negotiation, and communication skills. Play sessions also nourish each family by relieving stress and forging important emotional bonds. 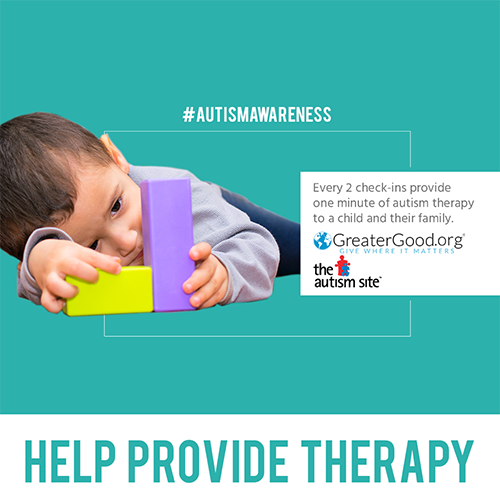 If you want to learn more about The Autism Site, you can check them out at theautismsite.greatergood.com. 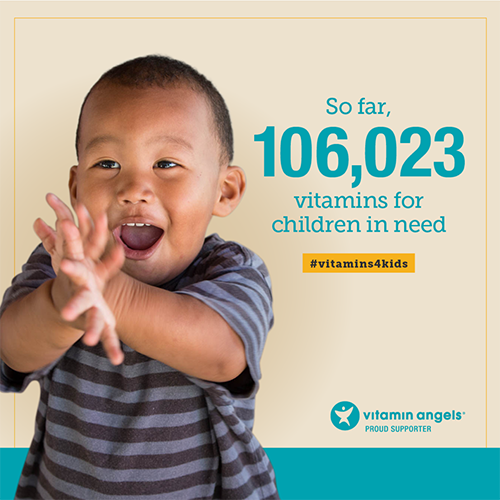 This March we are so excited to partner with Vitamin Angels to improve the health of children in need around the world. Every check-in or review on Facebook, or location tag on Instagram will provide a vitamin to a child in need. Vitamin Angels provides lifesaving vitamins to mothers and children under five at risk of malnutrition — reducing preventable illness, blindness, and death — to create a healthier world. Vitamin A supplements work to strengthen immune systems and fight off life-threatening illnesses for children who don’t have access to foods with vitamin A. It only takes two doses of vitamin A per year to combat the devastating effects of vitamin A deficiency. If you want to learn more about Vitamin Angels, you can check them out at vitaminangels.org. This February we are excited to partner with Hope for Haiti to provide education to children in southern Haiti. Every 10 check-ins will provide a day of education to a classroom of 30 children. Hope for Haiti’s holistic approach is a model that connects, heals, and empowers rural communities on the road to sustainable, long-term development. Hope for Haiti considers education, their longest running program, to be the keystone to sustainable development. By supporting, strengthening, and expanding the resources of existing schools, they are providing children with the tools they need to create their own future. If you want to learn more about Hope for Haiti, you can check them out at hopeforhaiti.com. 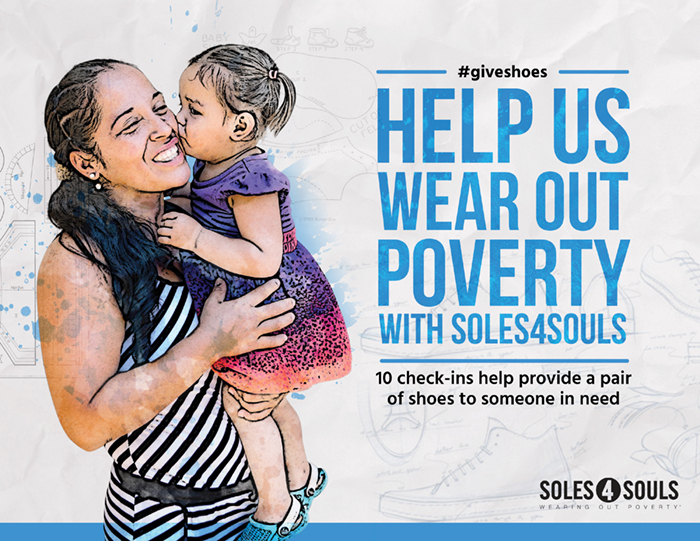 This January we are excited to partner with Soles4Souls and help provide winter coats again! Every 10 check-ins will help provide a coat to someone in need. Soles4Souls collects and ships new winter coats to those that need it the most. There are 50 million Americans living in poverty today and many of them will need a warm coat this winter. New coats provide warmth, comfort and safety for homeless men, women and children. A new coat can also help bridge the economic gap for families living in need. If you want to learn more about Soles4Souls, you can check them out at https://soles4souls.org/our-impact/. This December, for the holiday season, we are happy to partner with Toys for Tots to provide age appropriate books to kids. 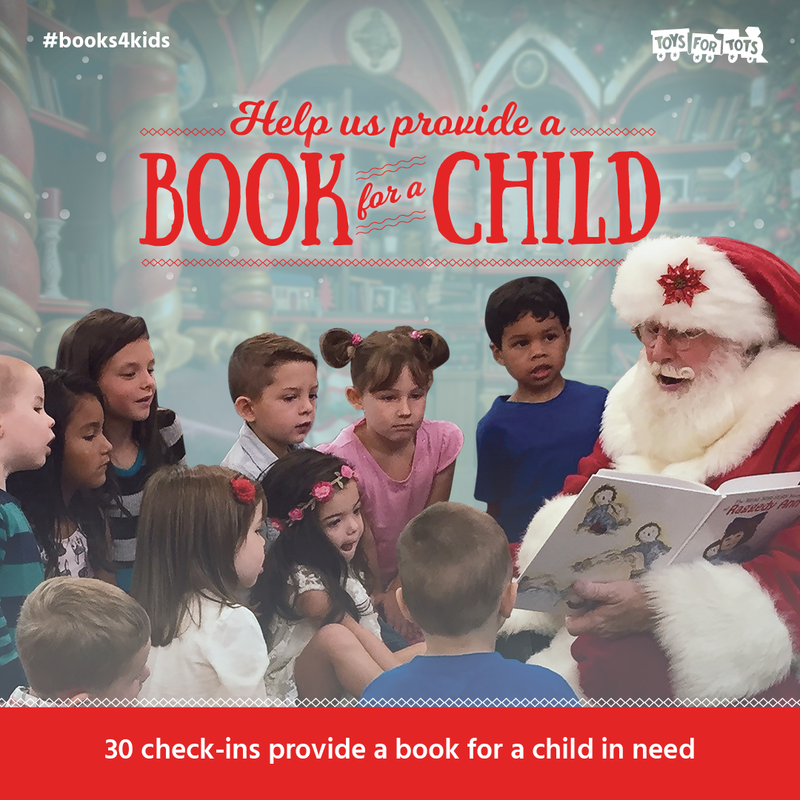 Every 30 check-ins will provide the gift of a book for a child. Toys for Tots helps less fortunate children experience the joy of the holiday season. Last year, they collected and distributed over 18 million toys and books to 7 million less fortunate children. If you want to learn more about Toys for Tots, you can check them out at http://www.toysfortots.org. For the month of November, we are working with Feed A Billion and every check-in at Coast to Coast Events will provide a meal to someone in need. 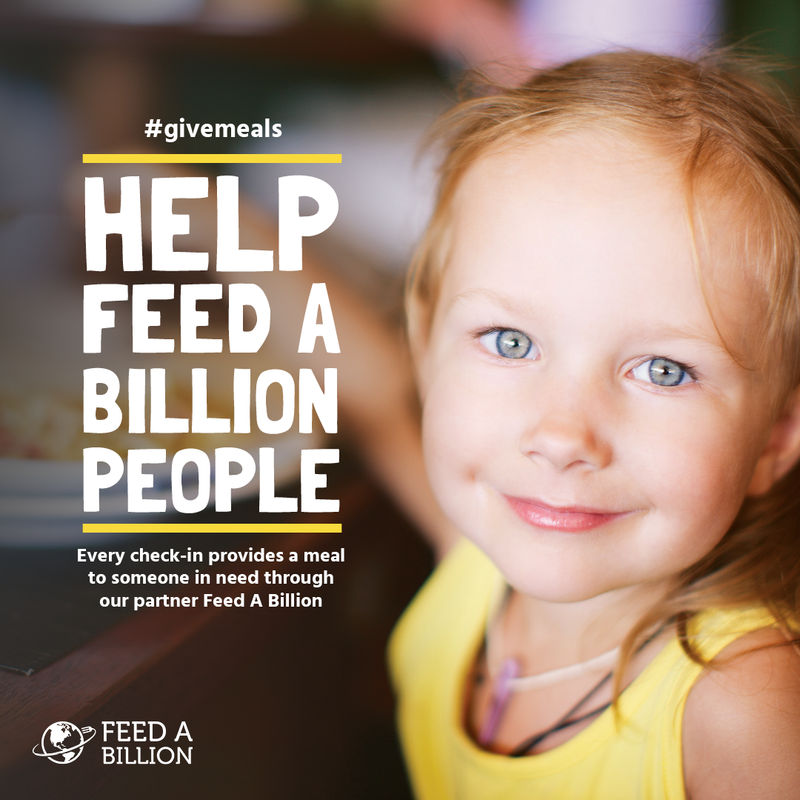 Feed A Billion raises funds to feed children and families in need in every corner of the globe. They partner with networks of food banks that have the most efficient methods of food distribution to minimize the cost of each meal. Their long term goal is to feed one billion people by 2020 - and we are going to help them do that! You can check them out at feedabillion.org. This past October, during breast cancer awareness month, we were proud to partner with the Bright Pink to provide women tools for detection and prevention of breast cancer. 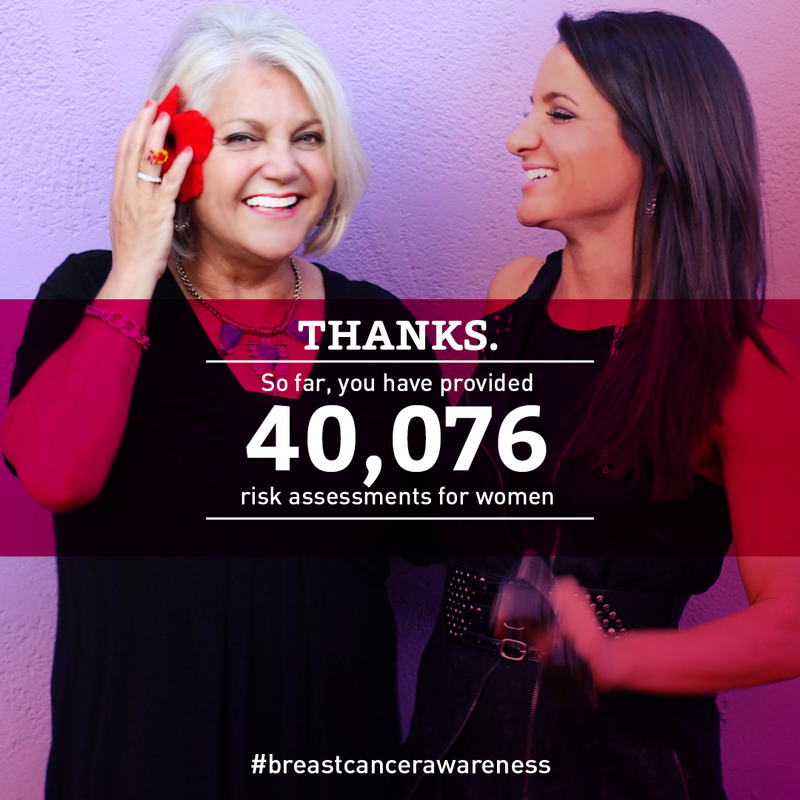 Every 3 check-ins helped provide 1 woman access to a breast cancer risk assessment. Bright Pink is a national non-profit focused on saving young women’s lives through the prevention and early detection of breast and ovarian cancer. 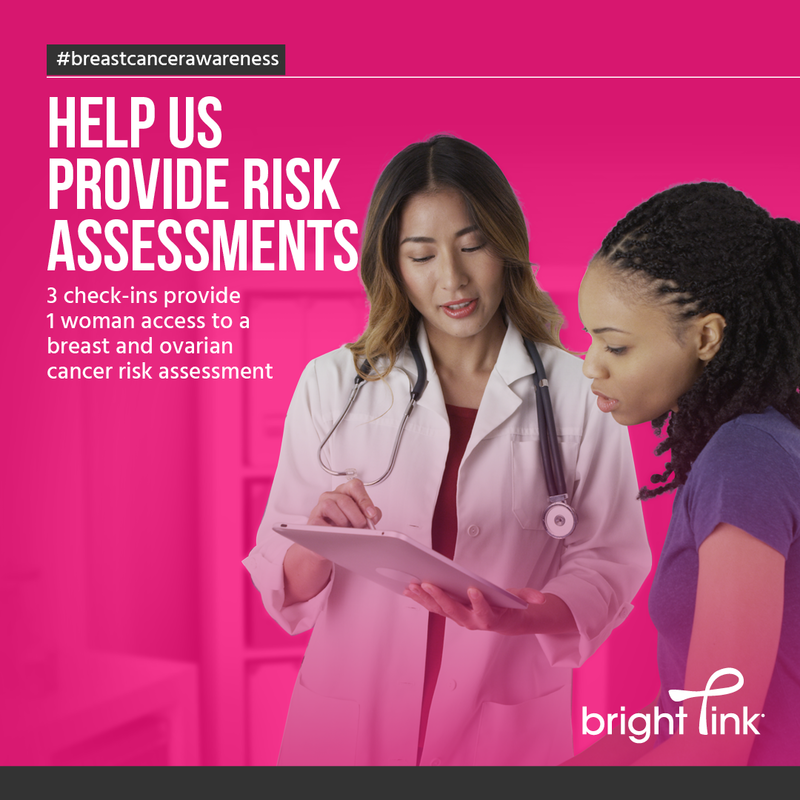 Bright Pink’s innovative programs educate and equip young women and their doctors to assess their risk for breast and ovarian cancer, reduce their risk, and detect these diseases at early, non-life-threatening stages. If you want to learn more about Bright Pink, you can check them out at https://www.brightpink.org/. For the month of September, we partnered with the Rescue Bank to supply bowls of food to shelter animals. 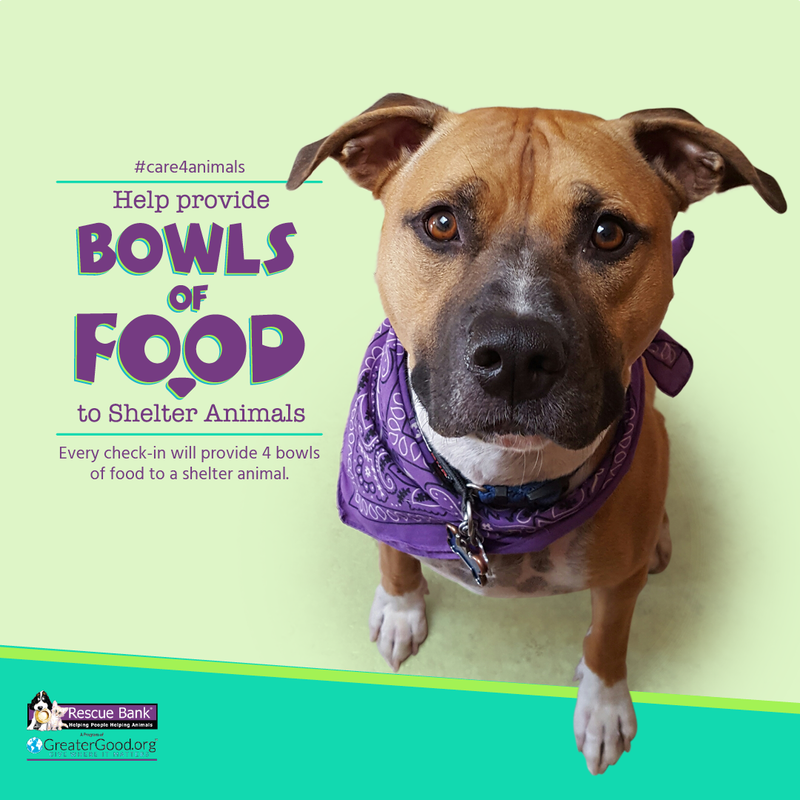 Every check-in helped provide 4 bowls of food to a shelter animal. The Rescue Bank operates on a “food bank” model by collecting and redistributing donated pet food, supplies, and donations to qualified animal welfare organizations. Their efforts allow rescue groups to focus on services such as spay/neuter, vet services, facility management, and adoption events. If you want to learn more about the Rescue Bank, you can check them out at http://rescuebank.org/. This August, we are partnering with buildOn to provide bricks to build schools in developing nations! 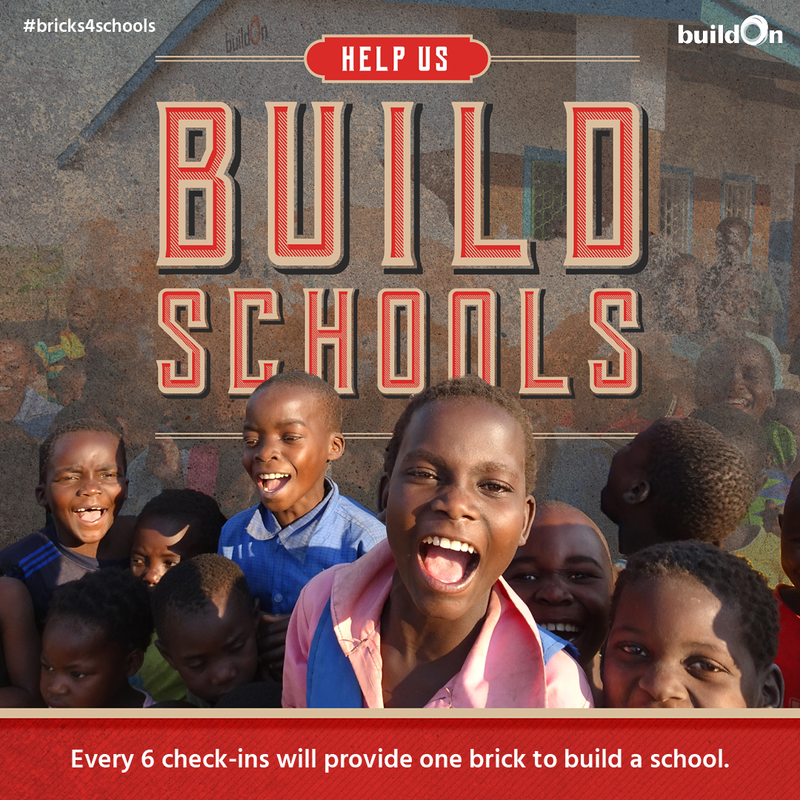 Every 6 check-ins will provide one brick to build a school. buildOn’s mission is to build schools in villages that historically have had no adequate school structure. buildOn has built more than 1000 schools in seven countries around the world: Burkina Faso, Haiti, Mali, Malawi, Nepal, Nicaragua and Senegal. This month, check-ins at our location are going towards building a school in Nicaragua. This July, we are excited to partner with H2OpenDoors to provide safe drinking water to people in need. H2OpenDoors is a program of The Rotary Club with a long term goal of providing access to clean, safe drinking water for one million people throughout developing nations. The team of volunteers at H2OpenDoors travel to areas of the world most in need of clean water and install a SunSpring water filtration system that will provide safe drinking water for 10,000 people every day for 10 years. 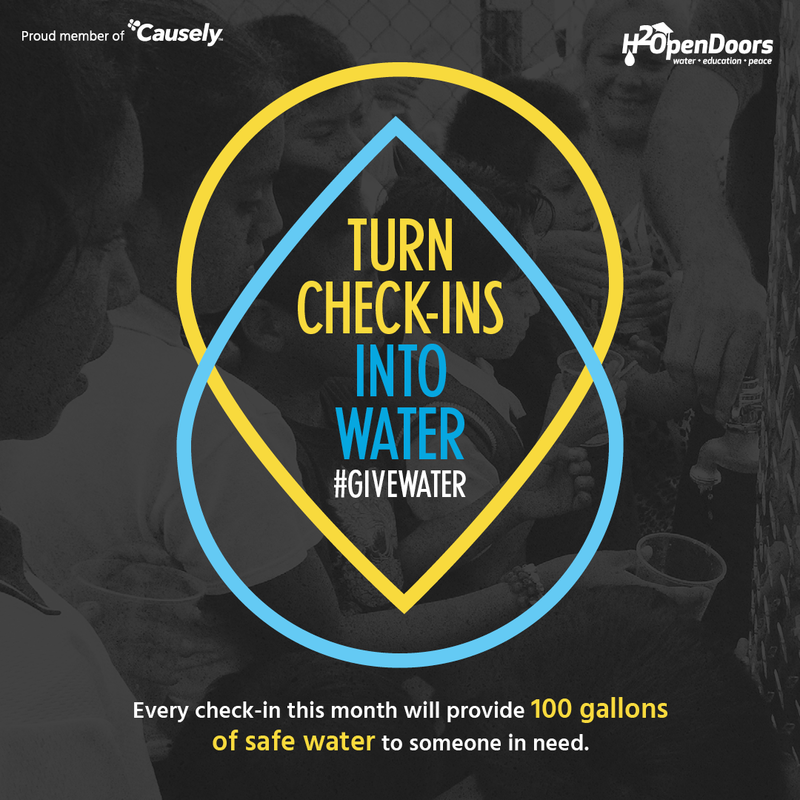 Every check-in this month will provide 100 gallons of safe water to someone in need.If you want to learn more about H2OPenDoors, you can check them out at www.h2opendoors.org. The hashtag this month is #givewater. This March our charity of the month is working to provide meals for children in need. 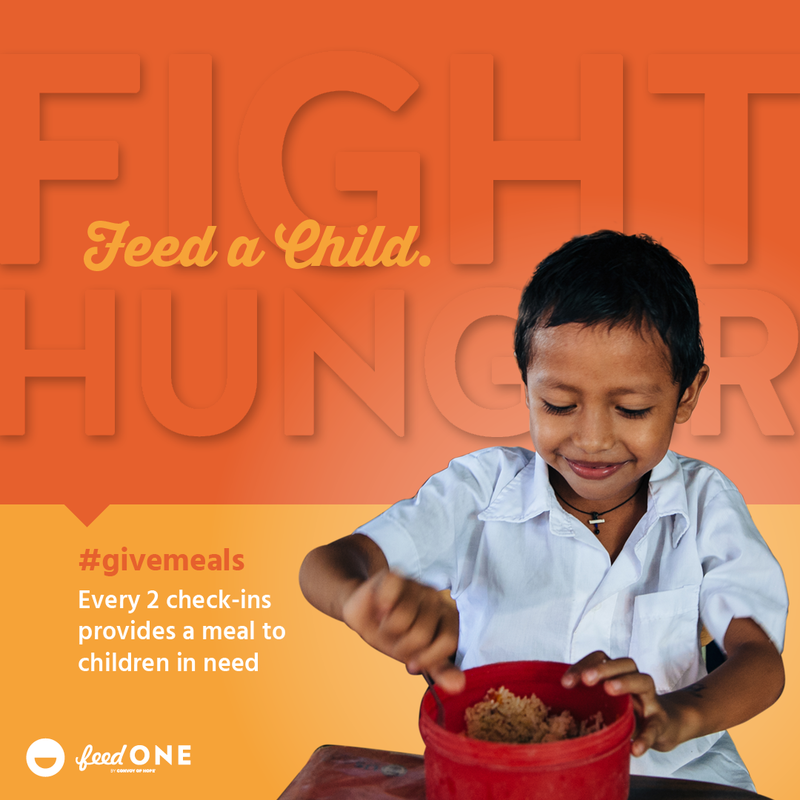 Each check in and location tag helps provide meals through feedONE. In Febuary, our charity of the month was Guiding Eyes. This company helps train seeing eye dogs for the blind. Together with your help, and the help of Causely, we provided dog food for those puppies. 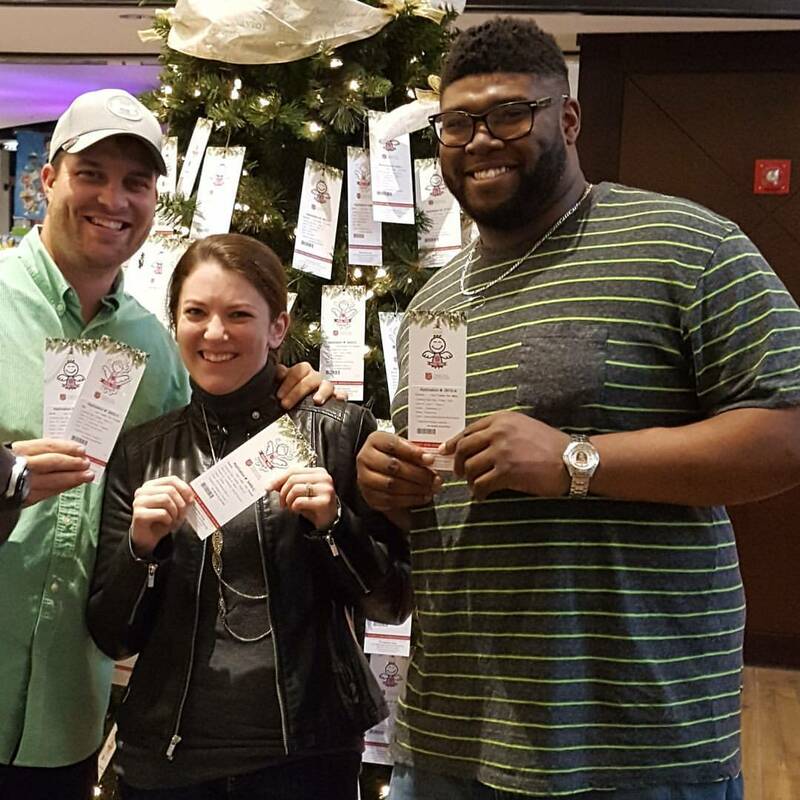 This past Christmas, our team reached out to the Angel Tree with Salvation Army. Together we were able to sponsor eight children’s Christmas! January was our first month working the Causely! 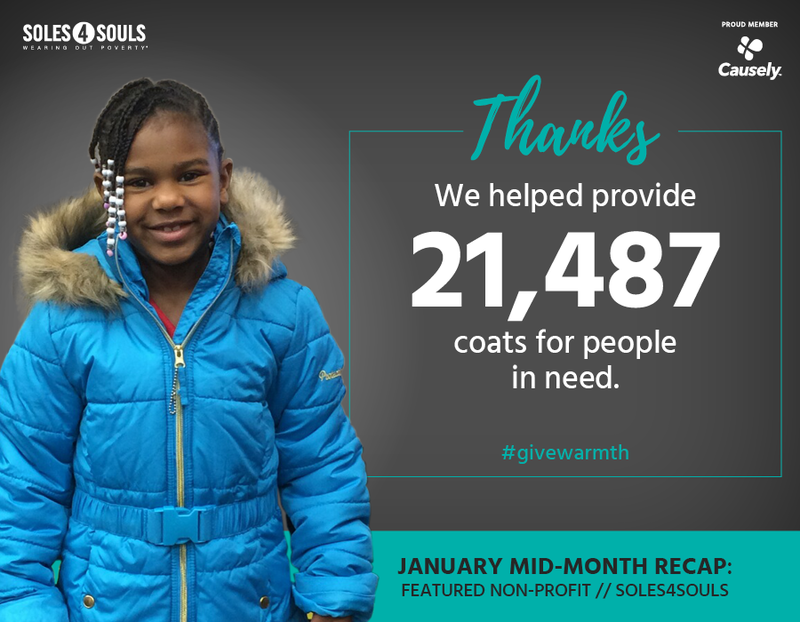 Based off check-ins on social media, together we helped provide winter coats for those in need with Soles4Souls! 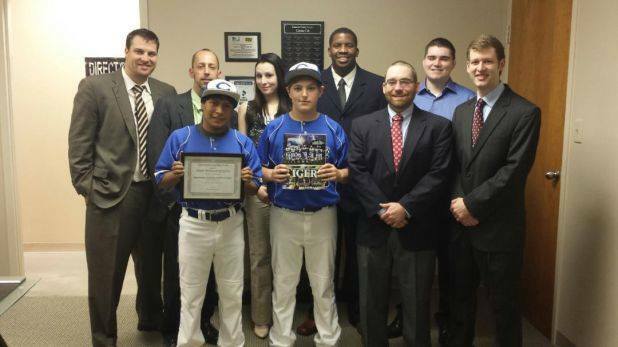 Two years running we supported the Childersberg Middle School Tigers baseball team! 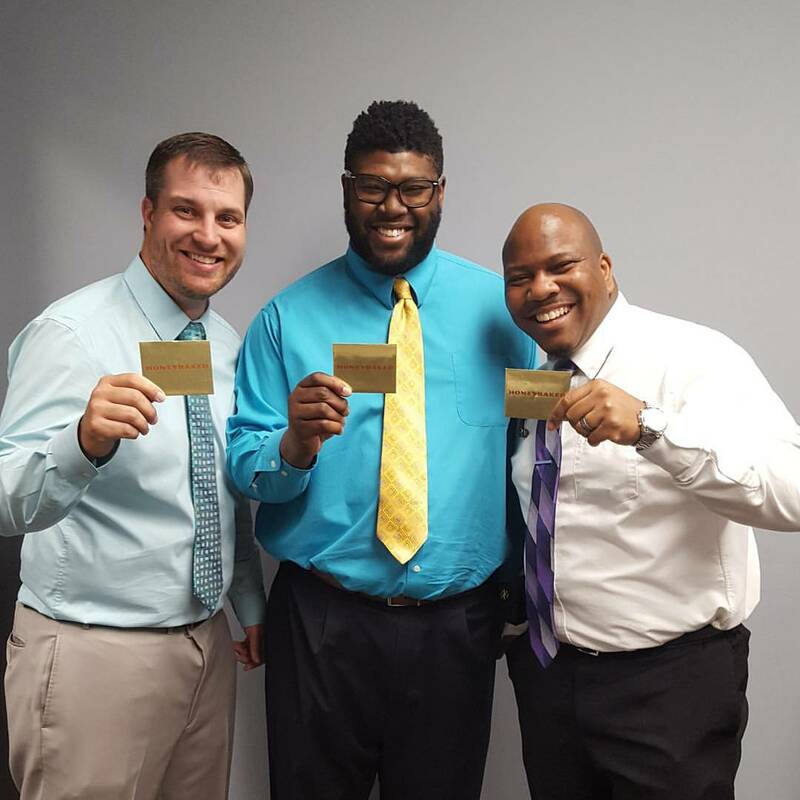 We have gone on to also support schools like the Hoover Buc’s football team! 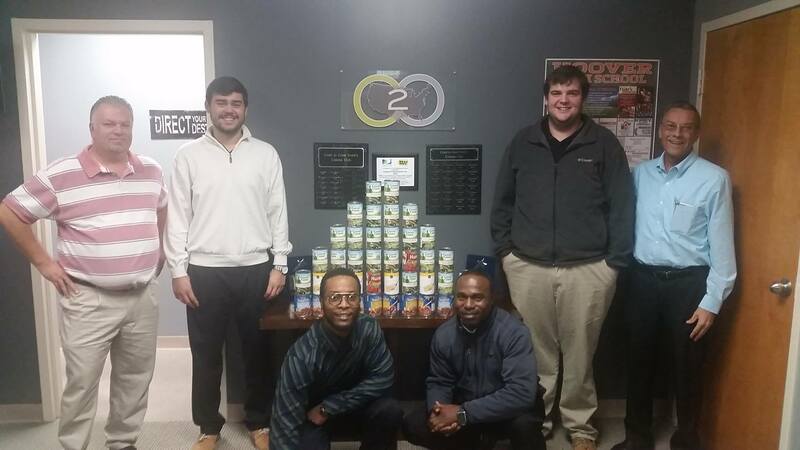 Annually, the Coast to Coast Events team works with the Foundry to help provide canned goods for those in need. If you would like to donate – Please contact Alice in HR. During the Thanksgiving season, we reached out and provided three families their Thanksgiving meal! 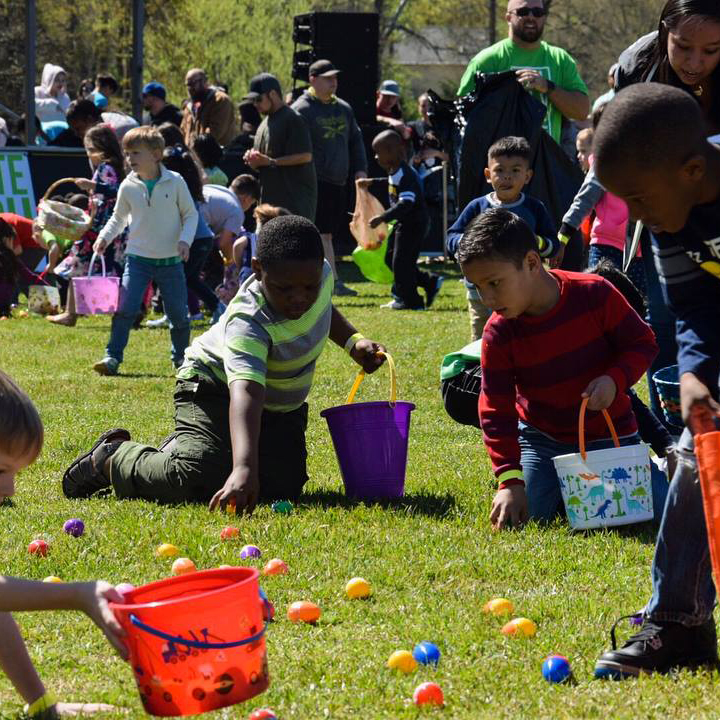 Thank you to Cultivate Church for helping us reach our community! 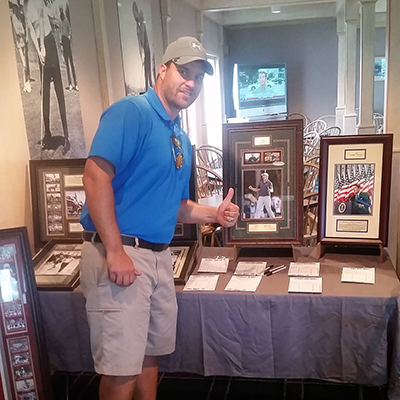 We partnered with Bent Brooke Golf Course to help support the Birmingham Children’s Hospital through their silent auction.